They’re out there, and they always will be. That’s just fine… as long as ‘out’ is where the pests stay. 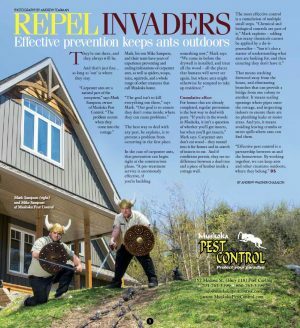 Mark, his son Mike Sampson, and their team have years of experience preventing and ending infestations of carpenter ants, as well as spiders, wasps, mice, squirrels, and a whole range of other creatures that call Muskoka home. The best way to deal with any pest, he explains, is to prevent a problem from occurring in the first place. For homes that are already completed, regular prevention is the best way to deal with pests. 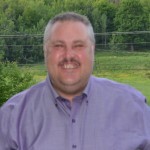 “If you’re in the woods in Muskoka, it isn’t a question of whether you’ll get insects, but when you’ll get insects,” Mark says. Carpenter ants don’t eat wood – they tunnel into it for homes and in search of insects to eat. And they see no difference between a dead tree and a piece of lumber inside a cottage wall, if conditions permit. That means stacking firewood away from the house, and eliminating branches that can provide a bridge from one colony to another. It means sealing openings where pipes enter the cottage, and inspecting indoors to ensure there are no plumbing leaks or moist areas. And yes, it means avoiding leaving crumbs or sweet spills where ants can find them.